Public Relations is a distillation of a photographic project begun by Garry Winogrand in 1969 when he was awarded a Guggenheim Fellowship to photograph what he called “the effect of media on events.” With his characteristic zeal, passion, spontaneity and intensity, Winogrand photographed an array of public events including museum openings, press conferences, sports games, demonstrations, award ceremonies, a birthday party and a moon shot. The photographs depict our emerging dependence on the media as well as how the media changes and sometimes even creates the event itself. First published to accompany a 1977 exhibition at The Museum of Modern Art, New York. No shot is about just one thing. 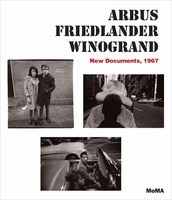 Winogrand the stalker may anger his subject: What we see is sometimes what he partly caused.